Want a high-paying career, but only have time for a two-year college? Check out Connecticut’s best community colleges by earning potential. You don’t have to get a bachelor’s degree to have a successful career. In fact, there are lots of high-paying, meaningful jobs that you can land with an associate degree. 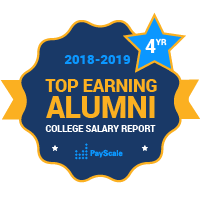 To help you make a smart choice about where you should earn an associate degree in Connecticut, PayScale has ranked schools that grant 2-year degrees in this year’s College Salary Report. Connecticut is the southernmost state in New England, and sits directly atop New York, meaning students who attend college in the Constitution State have easy access to both Boston and Manhattan, or, even more importantly, lobster and pizza. Finance and insurance are Connecticut’s biggest industries, and many students who go to school in the state decide to work in one of these professions.